Ordered yesterday through box .....paid £289 open box. ...but Brand New. Being delivered today between 12.00-1.00. Will update you later. Reviews seemed good & thought it was a great price. Ordered yesterday through box .....paid £289 open box. ...but Brand New. …Ordered yesterday through box .....paid £289 open box. ...but Brand New. Being delivered today between 12.00-1.00.Will update you later. Reviews seemed good & thought it was a great price. How’s it open box but brand new? On paper sounds like a serious deal? Is it also one colour the black ? How’s it open box but brand new? On paper sounds like a serious deal?Is it …How’s it open box but brand new? On paper sounds like a serious deal?Is it also one colour the black ? Asus is notorious for its build quality. If you want a cheap lappy for 1-2 years for basic stuff (4GB ram), then this is a good deal. In 1-2 years, this may die or resale value will be around £50-80. And if you want a proper decent lappy which may work for few years, then get surface. I got one (pro with flumsy keyboard) and it is better than all the laptops which I have had in the past. Asus is notorious for its build quality. If you want a cheap lappy for 1-2 …Asus is notorious for its build quality. If you want a cheap lappy for 1-2 years for basic stuff (4GB ram), then this is a good deal. In 1-2 years, this may die or resale value will be around £50-80.And if you want a proper decent lappy which may work for few years, then get surface. I got one (pro with flumsy keyboard) and it is better than all the laptops which I have had in the past. Thanku but isn’t the surface over priced for very similar spec apart from i5 processor at twice the price ? Returned Item . Opened but unused Brand New.... in Original Manufacturers Box. Description read :Returned Item . Opened but unused Brand New.... in …Description read :Returned Item . Opened but unused Brand New.... in Original Manufacturers Box.Yes Black only. Would u trust that though ? I will return if not as described.......Worth a punt i thought for the price. Had been looking for a while & thought for the price the spec & reviews were good. Bought for son starting college. I will return if not as described.......Worth a punt i thought for the …I will return if not as described.......Worth a punt i thought for the price. Had been looking for a while & thought for the price the spec & reviews were good.Bought for son starting college. It was Windows 8, not Vista. I was considering this but is an older i3 processor and only 1 USB 3 port. It's not that bad just not ideal for what I need it for so gone with an 8th gen i5 from Argos for £50 more but without touchscreen. I think you notoriously mixed up quality with brand names, Asus is a quality make in general, though like all laptop manufacturers, they do have budget, normal, quality and flagship price bands. I stand corrected it was windows 8. I was considering this but is an older i3 processor and only 1 USB 3 port. …I was considering this but is an older i3 processor and only 1 USB 3 port. It's not that bad just not ideal for what I need it for so gone with an 8th gen i5 from Argos for £50 more but without touchscreen. Probably struggle to find stock. It's also not full HD screen but it has everything I need it for including long battery life. Just realised it's not £50 more cos I originally looked at another i3 then added £11 ish to get the i5. https://www.argos.co.uk/product/8261281Probably struggle to find stock. …https://www.argos.co.uk/product/8261281Probably struggle to find stock. It's also not full HD screen but it has everything I need it for including long battery life. How come u didn’t go for the hp one I posted on here on ao which is essentially same price as this after cash back and also voucher makes it even cheaper? It’s got full hd and higher spec overall? I think you notoriously mixed up quality with brand names, Asus is a …I think you notoriously mixed up quality with brand names, Asus is a quality make in general, though like all laptop manufacturers, they do have budget, normal, quality and flagship price bands. We all have opinions based on our experience. I had two laptops from acer, one mid-budget and one premium class (as they say). Both packed up within 2 years! I have tried Acer, Dell, Toshiba, IBM, Sony, Surface and Apple. I have my own reservations for all of these and there are pros and cons to each. 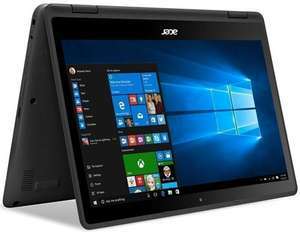 Acer is further down the list if you ever want a quality laptop. That is my opinion. If you have a different opinion, feel free to express and share your experience. However after using surface, macbook, and IBM, I can't see myself wasting money on acer. So can I ask u a questionHow come u didn’t go for the hp one I posted on h …So can I ask u a questionHow come u didn’t go for the hp one I posted on here on ao which is essentially same price as this after cash back and also voucher makes it even cheaper?It’s got full hd and higher spec overall? Got a link cos I saw an ASUS Vivobook you posted but not HP one and I haven't collected the Argos one yet so open to better offers. Got a link cos I saw an ASUS Vivobook you posted but not HP one and I …Got a link cos I saw an ASUS Vivobook you posted but not HP one and I haven't collected the Argos one yet so open to better offers. I beg your pardon u r right it’s the ASUs not hp. Main reason was the 7th gen dual core CPU compared to the HP's 8th gen quad core. Main reason was the 7th gen dual core CPU compared to the HP's 8th gen …Main reason was the 7th gen dual core CPU compared to the HP's 8th gen quad core. Oh is it a massive difference even taking into account the other extra specs of the ASUs? Oh is it a massive difference even taking into account the other extra …Oh is it a massive difference even taking into account the other extra specs of the ASUs? Yes quite a speed difference because it's a generation newer. Also twice the cores to work with. I have just found a better HP on AO though same spec as Argos one apart from Full HD and 256GB SSD and I don't have to drive 50 miles to get it. After 20% new account code and £50 cashback it's only another £20. So worked out well me re-looking at AO after your queries so thanks. The HP im now grabbing is the HP 14-bs100na. We all have opinions based on our experience. I had two laptops from acer, …We all have opinions based on our experience. I had two laptops from acer, one mid-budget and one premium class (as they say). Both packed up within 2 years! I have tried Acer, Dell, Toshiba, IBM, Sony, Surface and Apple. I have my own reservations for all of these and there are pros and cons to each. Acer is further down the list if you ever want a quality laptop. That is my opinion.If you have a different opinion, feel free to express and share your experience. However after using surface, macbook, and IBM, I can't see myself wasting money on acer. You 100% support my remark, you took Asus to mean Acer. Additionally the IBM had been absorbed into Lenovo about 8 years or so ago. You 100% support my remark, you took Asus to mean Acer. Additionally the …You 100% support my remark, you took Asus to mean Acer. Additionally the IBM had been absorbed into Lenovo about 8 years or so ago. you are correct and yes I confused both, however imho, they both are okish. Nothing great here. And yes IBM is lenovo now, but perhaps I will still call it IBM, as that is what they are known as for their roboustness! Yes quite a speed difference because it's a generation newer. Also twice …Yes quite a speed difference because it's a generation newer. Also twice the cores to work with.I have just found a better HP on AO though same spec as Argos one apart from Full HD and 256GB SSD and I don't have to drive 50 miles to get it. After 20% new account code and £50 cashback it's only another £20. So worked out well me re-looking at AO after your queries so thanks.The HP im now grabbing is the HP 14-bs100na. Please advise How do you get 20% of New Account Code??? Sorry my mistake it was £20.